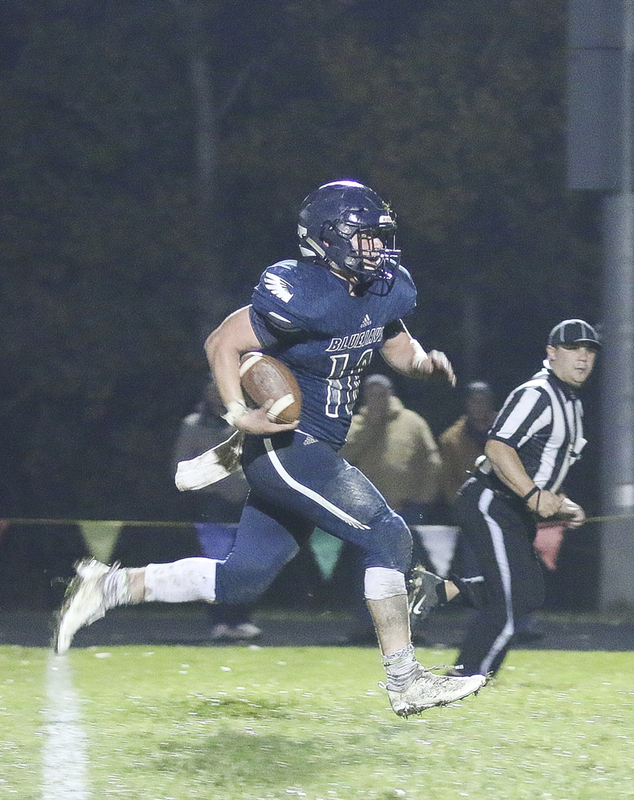 Senior running back Joe Gruber cruises into the endzone on this long run during the District game against Jeff West on Friday, October 27. The undefeated Sabetha Bluejays burst into the first round of playoffs last Friday night welcoming the 5-3 Jeff West Tigers to town. The Jays won the time of possession battle, and put points on the board to take the win 32-7. Sabetha chewed up almost 10 minutes of the first quarter on two drives, the first of which was a 13 play, 65-yard ground attack that was punctuated by a 1-yard touchdown run from quarterback Gabe Garber. After a two-point conversion pass to Drew Schmelzle on a broken P.A.T., Sabetha led 8-0 at the end of the first. Joel Hackney gave the Jays a two possession lead on an 18-yard burst to the endzone halfway through the second quarter. But the Tigers would answer on the subsequent possession when they drove 80 yards on 10 plays to narrow the gap to 15-7. Braeden Cox hit his longest field goal of the season just before the half splitting the uprights from 37 yards out. Sabetha led 18-7 at the intermission. Sabetha had 202 yards of total offense in the first half to Jeff West’s 130, and they controlled the game by maintaining possession for 17 of 24 minutes of the first half. Garber had 83 yards of rushing and Joseph Gruber had 42 on the ground. Gruber added to his personal stats in the second half, rushing for an additional 118 yards and two touchdowns, as well as hauling in 42 yards receiving for the night. The Tigers would be blanked in the second half and the Bluejays improved to 9-0 on the season with the 32-7 victory. With the win, the Jays draw a home game in the Regional contest with the opponent being Perry-Lecompton with their 32-20 win over Wamego. “We must play better than we did in the game earlier this year,” Michael said, referring to the Jays-Kaws contest earlier this season. The game will start at 7 p.m. Friday, Nov. 2, in Sabetha. Junior linebacker Gabe Garber executes a perfect form tackle on this Jeff West ball carrier on Friday, October 27, during the Bluejays District game in Sabetha. Junior defensive lineman Carson Ukele swallows up this ball carrier during the District game against Jeff West on Friday, October 27. Senior Elliott Strahm occupies two offensive lineman on this pass play during the District game against Jeff West on Friday, October 27. Senior defensive lineman Kamden Brownlee applies pressure to the Jeff West quarterback during the District game against Jeff West on Friday, October 27. Senior wide receiver Jesse Burger heads upfield with this pass during the District game against Jeff West on Friday, October 27. Senior linebacker Cauy Rokey jumps up and knocks down this pass attempt during the District game against Jeff West on Friday, October 27. Senior Elliott Strahm, left, and junior Carson Ukele, right, push upfield on this pass play during the District game against Jeff West on Friday, October 27. Senior Tristan Edelman cuts upfield through the running lane that the offensive line created during the District game against Jeff West on Friday, October 27. Senior wide receiver Jesse Burger blocks downfield on this running play during the first half of the District game against Jeff West on Friday, October 27.